Simple Commands mod adds a few new, simple text commands. Now, among the "standard" commands will have a new command that has the effect to your character. In total there are 23 different effects, such as speed and invisibility - it is the effects of potions. 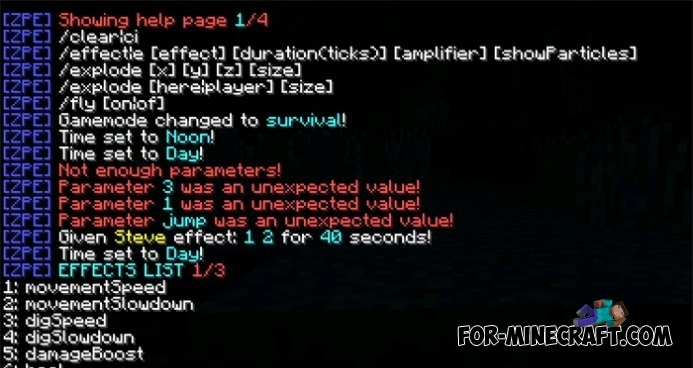 With these commands, you can affect the gamegame mode, weather, time, deceleration time, set the level of experience, and more in MCPE 0.14/0.15.7! New commands: /about, /coords (show your location), /lvl (change the level relative to the player). Have been added new commands: / pause and / changelog. Wait till next update guys you'll all love it promise! Can I use this without blocklauncher? If yes, how?